Reynard Morane was at his usual table in the Cafe Baudy, a somewhat risqué establishment built on a barge floating on the Deval Forest pleasure garden lake, when a beautiful man approached his table. This wasn't an unusual occurrence, especially in this cafe, but this beautiful man was a stranger. He said, "Captain Morane?" From his features and dark skin, the man was Parscian, a little younger than Reynard but not by much, tall and well-built and dressed in an elegant but understated way that suggested some professional occupation in the city. The coat was too expensive for the man to be from a university. For some reason, Reynard attracted a high percentage of men of academic persuasions. "Yes." Reynard smiled warmly. "Please join me." The man hesitated, then drew out the opposite chair. "A friend told me about you." "And which friend is this?" Reynard caught the waiter's attention and lifted his brows. The waiter sized up the situation professionally, then went to the bar for a fresh bottle of wine and glasses. "A man named Biendare." The man lowered his voice. "I believe he is known in some circles as 'Binny.'" "Binny?" Reynard frowned. This was not encouraging. Binny was not someone who would have recommended Reynard for an assignation. At least not the kind of assignation Reynard had hoped for. To make sure this man had really met Binny, he said, "At the roasted nut kiosk on the Street of Flowers?" "No, it was in March Street, at a wine bar that also sells fried fish." "Right." Reynard sat up, adjusting his attitude from invitingly indolent to business-like and alert. The waiter arrived at the table with the bottle and glasses. Reynard sighed and told him, "No." "No?" The waiter looked startled, then disappointed. "Oh. Coffee, perhaps?" The man cast a puzzled look at the retreating waiter's back, and Reynard admitted, "I was hoping it was an assignation." He waved a hand. "It's the Cafe Baudy, you know. There are often assignations." "Oh, yes, I..." The man obviously decided to drop that subject and pursue his objective. "My name is Amadel. I am the confidential secretary for the Lady Shankir-Clare. She needs assistance of a...particular sort." Reynard held up a hand as the waiter approached. He waited until the man had arranged the coffee service and departed, then said, "She's being troubled by someone but feels unable to confide the details to the Prefecture?" "Yes, exactly." Amadel added cream and sugar to his cup with the relief of a man who had been searching for help and was finally in the right place. This was odd. The Shankir-Clares were a family a rather famous diplomats, wealthy and well-respected in both Parscia and Ile-Rien, where the different branches of the family had originated. Reynard had never met any of them because they were the sort of people who were invited to the palace, not the sort who traveled in demi monde circles. No wonder Amadel hadn't been familiar with the Cafe Baudy. "How did you ever run across Binny?" "Lady Shankir-Clare's hairdresser knew him," Amadel said. "She said he was the best way to contact people who could help with...sensitive problems." "Is it blackmail?" Reynard asked. If one of the Shankir-Clare ladies had trusted her affections to the wrong man, and it wasn't someone associated with the infamous Count Montesq, Reynard could probably have it taken care of before dinner. "I quite like dealing with blackmailers. I have some experience at it." "It isn't an ordinary blackmailer. It's a sorcerer." Amadel's brow furrowed as if he was trying to control a wince of anticipation. He thought Reynard would refuse the commission now. Most of the people who did this sort of thing wouldn't tangle with a sorcerer. Reynard smiled. "Then Binny sent you to the right place." He lifted a hand to signal the waiter to bring the bill. In the Year End Wrap-Up and Questions post, petercline asked: What was your most difficult book to write from a creative standpoint? The first one that leaps to mind is The Death of the Necromancer. It was tricky in several different ways. Nicholas was also a very difficult main character to write. He's basically the person who would have turned out to be the world's Moriarty, probably doomed to kill or be killed by Inspector Ronsarde, except for his foster father's intervention. He's not really a sociopath, but his natural inclinations are in that direction, and writing his reactions to things didn't come natural to me. Whenever I got stuck on the book, it was usually because I'd written Nicholas as having an emotion or something that didn't work for his character. The example I use is the scene where they drive the coach into the square where his foster father was executed years ago. At first I had him not looking at the scaffold, and the whole book just stalled there. Finally I realized that he would have come to the square over and over again right after it happened, until he could look at that scaffold and not show or feel anything at all. I wrote The Death of the Necromancer because it was the kind of book I really wanted to read, and couldn't find anywhere. The books I found that were sort of in that vein were just really unsatisfying. Writing it, I figured out that was probably the case because it was a hard book to write. But it was worth it. Oh, and I'm still taking questions if anybody has any others. The Death of the Necromancer is now available as an audiobook, narrated by Derek Perkins, from Tantor Audio, in MP3 or CDs. It's also available on iTunes (scroll down for audiobooks), Barnes and Noble, Audible, and Amazon, and wherever else they sell audiobooks. The Death of the Necromancer was my third book, and came out from Avon Eos in 1998. It was a Nebula nominee, and was also the book where the crazy copyeditor (the person who is supposed to check grammar, punctuation, and continuity after the editing process is done and right before the book gets formatted for publication) who decided to re-write the book and take out Reynard Morane, because he was gay. Obviously, her re-write was thrown out, because copyeditors are not supposed to re-write other people's manuscripts, plus she was a very bad copyeditor. So the version of the book that came out was the one actually written by me. It's set in Ile-Rien, the same world as The Element of Fire, but sometime in the future, in Ile-Rien's Victorian/la Belle Epoque time period. The main character, Nicholas Valiarde, is a Moriarty-type figure. The complete text of The Death of the Necromancer in now online at Black Gate Magazine. Serializing the book online was a spur-of-the-moment idea at the Chicago WorldCon, and I'd like to thank John O'Neill for giving the book a home and for all the work to get it posted. * It was first released in hardcover by Avon Eos in 1998. * It was a 1998 Nebula nominee. * It was reprinted in French, Polish, German, and Spanish. * There is a Sherlock Holmes theme. Nicholas was influenced by Professor Moriarty, Reynard Morane by Sebastion Moran, and Ronsarde and Halle by Holmes and Watson. Madeline has more than a bit of Irene Adler in her, but also Ellen Terry and Sarah Bernhardt. Madele is a retired wicked stepmother, with her own family responsibilities. * The Element of Fire is set in the same world, but at some point in the past. One of Nicholas' ancestors is a character in it. * Nicholas and a few other characters from DotN appear in all three books of The Fall of Ile-Rien trilogy. All the Ile-Rien books and short stories are listed here. Some of the short stories and a map of the Palace of Vienne are also online. It's also available for $2.99US DRM-free on Barnes and Noble NookBook, Kobo, Amazon US Kindle, Amazon UK Kindle, Barnes and Noble UK, Kindle Canada, Kindle Germany, Kindle France, Kindle Spain, Kindle Italy and all the other international Kindle stores. The second part of The Death of the Necromancer is now online at Black Gate. It's basically about a Moriarty-like master criminal and his friends in an otherworldy version of La Belle Epoque Paris with magic, who get involved in a clandestine battle with a sorcerer who seems to be trying to raise the dead. Nicholas took out his watch and checked the time, again: the only nervous gesture he would allow himself to make. The private chamber was small and intimate, its walls covered in red brocade and the mirror above the mantelpiece etched with names, dates, and mangled verses by diamond rings. On the virgin white cloth of the table stood an unopened absinthe bottle and a silver serving set with the other paraphernalia necessary for drinking it. Nicholas normally preferred wine but for this night he favored the dangerous uncertainty of the wormwood liqueur. For now he was drinking coffee, cut with seltzer water. He glanced up as the door opened. Reynard sauntered in, crossing the room to lean heavily on the table. "They've just arrived — they're getting out of the coaches now," he murmured. His evening dress was a little disheveled and Nicholas could smell brandy on his breath but he knew Reynard was only pretending to be drunk. In the doorway behind him were several young men and women, laughing, leaning on each other tipsily. One of the young men was watching Reynard jealously. Nicholas pitched his voice too low for them to hear. "Very good. Will you be free to alert the others?" "Yes." Reynard jerked his head to indicate his companions. "I'm about to shed the window dressing and head for the hotel." He took Nicholas’s hand and dropped a lingering kiss on his fingers. Nicholas lifted an eyebrow. "Reynard, really." "It will make your reputation," Reynard explained. "I'm quite fashionable this week." He released Nicholas and turned to gesture airily to his audience. “Wrong room,” he announced. If you get impatient and want the rest, it's available for $2.99US DRM-free on Barnes and Noble NookBook, Kobo, Amazon US Kindle, Amazon UK Kindle, Barnes and Noble UK, Kindle Canada, Kindle Germany, Kindle France, Kindle Spain, Kindle Italy and all the other international Kindle stores. I think this is going to be a low energy day. I hope I get my writing quota done before 9:00 tonight. * Part One of The Death of the Necromancer is now online at Black Gate Magazine. The first four chapters are up now and new section will be posted every week. * Ann Aquirre posts about Sexism she's encountered on SF panels at an SF/f con and Comic-con. This was kind of a weird weekend. Friday, I decided to try to pick up another aerobics class and went to one at noon. (It turned out to be a combination of zumba and bar/weightlifting. It was fun for the first ten minutes! Then it was painful for fifty minutes. Note to self, be careful about committing to a class where you don't actually know what's going to happen.) On the way I drove past the bank near our house, and on the way back, saw it was surrounded by police cars. I looked at the news online, and yeah, while I drove past it earlier it was in the process of being robbed. Fortunately, nobody was hurt, and they caught the guy within about fifteen minutes. It was the small local bank we use, where everybody's nice and they sell fruit and nuts through the drive-through for part of the year and have events for the animal shelter and sometimes give away popcorn on Fridays. If a bank was going to be robbed, I wish the guy had picked the Citibank. Then there was another tornado in Oklahoma and it was just a crap week for a lot of people I know. At breakfast yesterday, a friend said he wished that there would be a week -- just one week -- where nobody we know died or had an accident or some other kind of major or minor disaster. So far this year, it feels like that hasn't happened. We also had a hellacious storm last night, so I didn't get much sleep. And had an anxiety dream that I was late for a panel at a huge WorldCon and couldn't find my pants. In the first week of July, it will be my twenty years since my first novel, The Element of Fire came out in hardcover from Tor in 1993. I'd like to do something for it, but have no idea what. One problem is that I'm super busy right now trying to fulfill commitments (I have to finish Emilie and the Sky World, the sequel to Emilie and the Hollow World, among other things.) and I don't have time to write a story or anything. Black Gate Magazine will be serializing the complete The Death of the Necromancer free online as part of their fiction series. It was my third novel, and came out from Avon Eos in 1998, and was a Nebula nominee. The first four chapters will be posted today at the Black Gate site, I'm not sure when it's going live. I wrote it because I wanted to read a fantasy-mystery set in a world based on La Belle Epoque France, and couldn't find one I liked. And I wanted to write a Moriarty-like main character who have been the villain in other books. It is and will be still available in DRM-free ebook at Barnes and Noble NookBook, Kobo, Amazon US Kindle, Amazon UK Kindle, Barnes and Noble UK, Kindle Canada, Kindle Germany, Kindle France, Kindle Spain, Kindle Italy. Last night I made baked flounder with a hollandaise sauce and fried potatoes for dinner, and it was very tasty. I think I will do it again at some point soon. Also got a really nice reader email about the Raksura books. Very good to read. * I think I forgot to link to this earlier (but maybe I linked to it and then forgot that -- it's been that kind of month), but: Rachel Neumeier reviewed The Fall of Ile-Rien trilogy Tremaine is my favorite character EVER! She is right up there with my other favorite-ever characters, like Miles Vorkosigan and Vlad Taltos and Eugenides. She is prickly, sarcastic, ruthlessly practical, sometimes insecure, occasionally suicidal, and doesn’t have a romantic bone in her body. You know that discussion a week or two ago about books with female protagonists but without a lot of romance? This is that book. I mean, there is romance — but it starts late in the series and it is never, but never, a gushy obsessive romance. * And I posted kitten photos of Tasha on Tumblr. I still have holes in my walls and ceiling, but I'm hoping the contractor will have a chance to get to us in the next couple of weeks. It's going to take a few visits to get all the taping and mudding and texturing done, but after the first one, the holes will at least be closed up. I am looking forward to this, because they leak dust and smell funny. Just wanted to mention that there has been a ton of questions and discussion of the Books of the Raksura in this post here. * There is a review of The Death of the Necromancer here at Roqoo Depot. * Style Reader did an outfit for Emilie of Emilie and the Hollow World! That's pretty awesome. Here's a book release post for Mirage by Jenn Reese and Poison by Bridget Zinn Bridget died from cancer in May 2011 at the age of 33, before getting to see her debut book published. Thursday! I planted tomatoes earlier this week, so naturally now it's going to freeze this weekend. * The feminist SF anthology I'm in, The Other Half of the Sky, got a great Publishers Weekly review. It will be out in April, in paperback and ebook. * Emilie and the Hollow World will be out on April 2. * Untitled Star Wars Novel can be preordered on Amazon and will be out on October 29. * I have an essay in Chicks Unravel Time, available now in paperback and ebook. * The audiobook (and paperback and ebook) of The Siren Depths, the third Books of the Raksura is now available. * I will be teaching two classes at the DFW Writers Conference on May 4-5 in Hurst, Texas. * I will be at LoneStarCon 3, the 71st Worldcon, in San Antonio, Texas on August 29 through September 2. First, which I just found out myself, The audiobook of The Siren Depths is now available on Audible.com, narrated by Christopher Kipiniak. It's just gone up on Audible, so it should be also available on Amazon and iTunes once the listing has a chance to get updated in their systems. 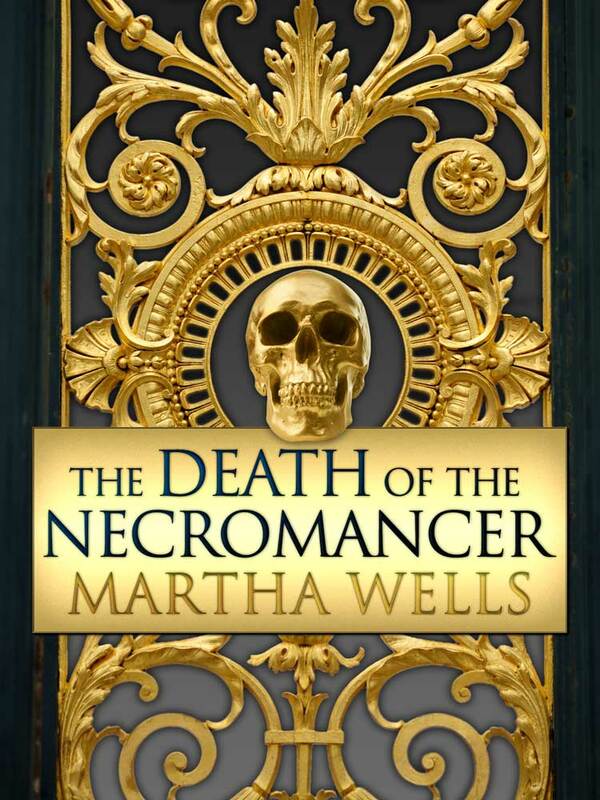 Second, The Death of the Necromancer is now available in ebook. Cover designed by Tiger Bright Studios. The Death of the Necromancer was my third novel. It came out in hardcover in 1998 from Avon Eos and later in paperback. My agent had originally offered it to Tor Books, who had published The Element of Fire and City of Bones, but after looking at the first two hundred pages, my editor at Tor turned it down. It was published by Avon and ended up on the final ballot for the 1998 Nebula Award. It's a dark fantasy/adventure/mystery, set in the same world as The Element of Fire but a few hundred years later. Like the Fall of Ile-Rien trilogy (The Wizard Hunters, The Ships of Air, The Gate of Gods), it's a world that had gaslight and trains and was experimenting with electicity, long before steampunk was popular. I wrote it because it was the kind of book I wanted to read and couldn't find anywhere. This is the book with Reynard, from the Don't Let Then Take Your Reynards essay. And if you've read the Fall of Ile-Rien trilogy, this is the book with Tremaine's parents, Nicholas and Madeline. It did really well, but Avon Eos was eventually bought by HarperCollins, which let The Death of the Necromaner go out of print around 2002-2003, before The Wizard Hunters came out, even though the books were set in the same universe. The first chapter is on my web site here. It's available at Barnes and Noble NookBook, Kobo, Amazon US Kindle, Amazon UK Kindle, Barnes and Noble UK, Kindle Canada, Kindle Germany, Kindle France, Kindle Spain, Kindle Italy, and should be DRM-free. I'm at ConDFW! It's a new hotel this year, and very nice. I didn't do much last night except do my reading and hang out and talk to people. The first chapter and more info about the book is on my website here. The other cool news is that I got a formal invitation by the Dean of University Libraries to go to the exhibit preview and dinner for the Deeper Than Swords event with George R.R. Martin at Cushing Library TAMU. It came with a little metal replica sword, too! So I'm pretty excited about that. I'm getting the text of The Death of the Necromancer ready to release as an ebook. Hopefully this will happen sometime in the later part of February, if all goes well. The book originally came out in 1997, and was a nominee for the Nebula award in 1998. I'll post the Necromancer cover when it's closer to the release date. The book will also be serialized online free by Black Gate Magazine. Another cool thing: petercline wrote some music for The Cloud Roads! You can listen to it on my web site on the fan art section for the Raksura books. Eleven original stories by recipients of the Octavia E. Butler Memorial Scholarship (2007 through 2012), plus a reprint of "Speech Sounds" by the scholarship's namesake, Octavia E. Butler. This anthology also includes a brief memoir of Butler by her Clarion classmate Vonda N. McIntyre and an introduction by Nalo Hopkinson. Edited by Nisi Shawl, published by the Carl Brandon Society, the administrator of the Butler Scholarship Fund, and available at Book View Cafe. The Death of the Necromancer, published in 1998, was my third novel, and my first with a new publisher, Avon Eos. Everything went fine through the editorial process, right up until I received the copyedit, and found that one of the major supporting characters, Captain Reynard Morane, had been all but removed from the book. And it happened that Reynard was gay. I'd worked hard on Reynard, and I liked him a lot. He had started out as a template. I wanted the main character, Nicholas Valiarde, to be Ile-Rien's version of Moriarty, and Reynard was his Colonel Sebastian Moran. But in the writing, Reynard emerged immediately as funny and kind to his friends and deadly to his enemies. The one guy in the room that everybody knew they really didn't want to get in a fight with. A very good soldier, a very good friend, and a very sexual person. He was kind of a weird combination of Oscar Wilde and Oliver Reed, but unlike Oscar Wilde he wasn't going to come to a bad end because of a love affair. He was a little too old and too experienced and too much of a serial monogamist to fall too hard for anybody. I wanted him to be the polar opposite of the stereotypical gay character who suffers and dies because of his forbidden whatever, and to end the book better off than the other characters. But this copyedit came back with massive alterations handwritten on the manuscript, with bad grammar and incorrect word choices inserted, weird demands for all sorts of things to be explained that didn't need to be explained (like the color of the tablecloth in a room description, or the main character's choice of beverage), and odd demands for rewrites. (The copyeditor wanted me to rewrite one section because she thought it was too cold for the characters to be outside.) (The publisher really doesn't want you to rewrite the manuscript during the copyedit. They really, really don't. And they really don't want a copyeditor to tell you to do it.) There were a lot of seemingly random deletions of descriptions, whole scenes, conversations and other things you needed to understand the plot, but the thing that stood out to me was that Reynard's dialogue had been all but excised from the book, and that the cuts to his part had started after it became apparent to the reader that Reynard was gay. He was important to the plot in a number of ways and helped uncover some of the information that let Nicholas and Madeleine, the other viewpoint characters, solve the mystery before the Necromancer kills them. In the copyeditor's expurgated version of the book, Reynard is still around for the first couple of chapters, but after the point where it was made clear that Reynard is gay, suddenly his dialogue was all marked as deleted. The conclusion I instantly snapped to was that Reynard had been removed for his sexuality. Of course, I don't know for certain if that was the case and I sure can't prove it. I never found out why the copyeditor did what she did, or why she thought she could get away with it, if she thought it was really her job. (And some of the things she did were really strange, not like she had never read a fantasy novel before and didn't understand the genre, but like she had never read fiction before.) But on that day, I would have sworn in court that Reynard was deleted because he was gay. And it amounted to the same thing. He was gay and he was gone. The editor asked me if I could just stet everything, but I thought the book really needed a real copyedit, and it hadn't gotten one. I sent back the mutilated manuscript and the editor ended up throwing out that copyedit entirely and having it redone, so everything was fine and my version of The Death of the Necromancer (with Reynard intact) was the one that got published. And the book ended up on the 1999 Nebula ballot. But I guess my point is, it's your book, and don't let anybody take your Reynards out of it.